A one of a kind music camp for children who love to sing! 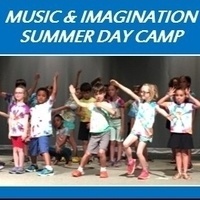 Music & Imagination Summer Day Camp (July 15-19th, 2019 from 8AM to 2:15PM) features singing, dancing & crafts on the campus of Loyola University Maryland in Baltimore. Children learn and use the solfa method of reading music and sing choral repertoire. Taught by Kodály trained counselors, this fun-filled week includes puppet musicals, folk dancing, singing games, and outdoor activities. All children participate in a performance the last day of camp. Snacks and materials provided. Camp tuition is $175 for the week. Please visit www.ccmsings.org for more information, email ccm@ccmsings.org or call 410-494-1480.